First : “Where is District 34?” or “Am I in District 34?” If you are still wondering the same, we have maps of 34 here tonight. If you don’t live in 34, you can’t vote for me, but you can ADVOCATE for me. If elected, I will serve residents of 34 and all of Nashville. Please also find friends and family on the District 34 map, and be in touch with them, forward them my newsletter, and share my Facebook page. Your support in that way is invaluable. The answer to that is, yes, I absolutely know what I am getting into, and I am approaching this job with much optimism and enthusiasm. This job requires the ability to happily address the little things like a missed trash pick-up, a leaning stop sign, or a needed pot hole repair and the ability to tackle larger, and seemingly intractable, countywide issues. This job requires patience and a proactive and intentional attitude, and I have that in abundance. I am well-suited to the job of a Metro Councilperson because I am a friendly, collaborative, consensus builder, and I’m also a tenacious problem solver. I don’t mind putting in long hours to get things done right. I have been an active civic volunteer in Nashville for 15 years, and I have learned volumes in my interaction with Metro Government. and its dauntingly numerous Departments and Boards—Public Works, Planning Department, the Water Department, the Parks Department, Metro Public Schools, the BZA, the MTA—you name it, I have met with them, emailed with them, and worked with them along with area non-profits, businesses, property owners and fellow neighborhood leaders. I want to bring that significant volunteer experience—those successes, frustrations, and challenges, and those hard-earned skills, to the service of our city. This is an exciting and vibrant time to live in Nashville as more and more people are witnessing and testifying to our City’s many strengths. We are growing rapidly, and growth is good, but it comes with sizable challenges. We need smart growth. Growth that respects neighborhoods. We need legislators that can keep their eye on the ball and be proactive, rather than reactive, to be intentional rather than scattershot. It’s time for Metro Council to get serious. In August, Nashville will be electing a new mayor, and over 60% percent of the Metro Council will be first time representatives. Every citizen in every district needs to pay close attention during this campaign season, ask the tough questions, and tell those running for office your concerns and your ideas. The work your elected city representatives do, or don’t do, affects you daily and deeply. My opponent does not have the civic, non-profit, and neighborhood experience that I do, and EXPERIENCE MATTERS. I have the experience and the education to read, listen, question, analyze and address the complex issues our City faces related to population growth and zoning, education and workforce development, traffic and transit, budget and infrastructure—from Google Fiber to sewer pipes to sidewalks. Nashville is doing a lot of things right. For example, if you call them, Metro Public Works will very promptly fill your pot hole or fix a leaning stop sign—but that’s the easy stuff. What Public Works does NOT do well is sidewalk infrastructure and bicycle infrastructure, because those are harder, and fra nkly, when things get complex in this city, or involve multiple departments coordinating, too often they just don’t get done. If your child cannot safely bike to their friend’s house without you worrying that they will be struck by a car, our city is not on the right track. If our seniors cannot safely cross the street when they are walking to the YMCA or the grocery store, our city is not on the right track. You need to elect someone who will not accept these failures and who is committed to making our city a safer and more enjoyable place for all children and families to live, learn, walk, bike, work and play. Our City has kicked the can down the road on infrastructure, transit, and capital improvements to our schools for far too long, but the future has arrived, and by 2040 there will likely be a million more people living in our region. That’s just 25 years from now. Looking 25 years in reverse, 1990 doesn’t seem like very long ago. The time is now to prepare for that growth, and the person you need representing you in Council should not be someone who just got interested in these issues a few years ago. 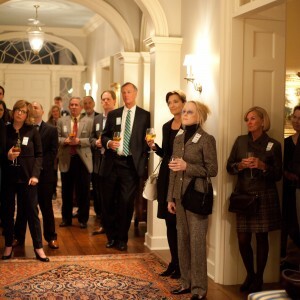 I’ve been tirelessly devoting the majority of my “free” time to reading and meeting, and understanding Nashville’s challenges and working to solve problems and create opportunities for 15 years. I am asking for your support and your vote so that I can bring my experience and my skills inside the process of Metro Government and start getting things done. No one will work harder for you and your family than I will. No one will work harder for your neighborhood and your Nashville than I will. With your help as a donor, a volunteer, an advocate or a voter, we’ll all be back together again on August 6th celebrating our VICTORY! I hope you will make sure to chat with me before you leave. I am happy to answer any and all questions about where I stand on particular issues. I value being accessible, so you are welcome to email or call me anytime. Happy spring! During my childhood, I lived for many years on five wonderful acres on Granny White Pike. There were lots of trees to climb in, a workshop, a potting shed, a green house, lots of gardens, a fish pond, and a root cellar! Pretty much paradise for a young person. Each year in late winter and early spring, I eagerly anticipated the arrival of daffodils that had been planted by our home’s previous owners way back in the 1940s. 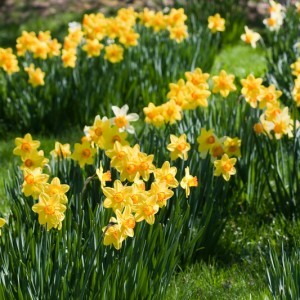 Now this was no ordinary cluster of daffodils–this was an immense cutting garden with thousands of bulbs and blooms in multiple rows–a beautiful sight to see and smell and experience. I wonder if the owners knew that the bulbs they planted would be delighting a new family over 40 years in the future? Planting thousands of daffodils is a gift to the future, not just for one spring but for several generations. Daffodil bulbs and their potential remind me of the green investments that our city can “plant” today–like greenways, protected bike lanes, sidewalks with green buffers, street trees, water gardens, bioswales, pervious pavement, canopy trees, native flowers, and pocket parks. If these infrastructure “bulbs” are planned thoughtfully and planted well, Nashville and Nashvillians will be enjoying the beauty and utility of those investments (and daffodils) for generations to come. One place that comes to mind when I think about daffodils and the importance of enhancing and maintaining green space is the “traffic island” at the intersection of Abbott Martin & Cleghorn. In the early 2000s, as a volunteer for The Green Hills Action Partners (TGHAP), I applied for a small grant from the Mayor’s Office of Neighborhoods for a brick and limestone welcome sign to provide a sense of arrival in the business district. TGHAP partnered with surrounding property owners and businesses to plant bushes and seasonal flowers, but my favorite part of the process was planting daffodil bulbs with fellow volunteers. We requested those bulbs from Metro Beautification/Public Works, and you too can get daffodil bulbs from Metro, if you focus your efforts at a local school. Start thinking now about partnering with a school to plant daffodils this fall. The deadline is October 31st to request bulbs via this form, and November is the ideal time to plant them. 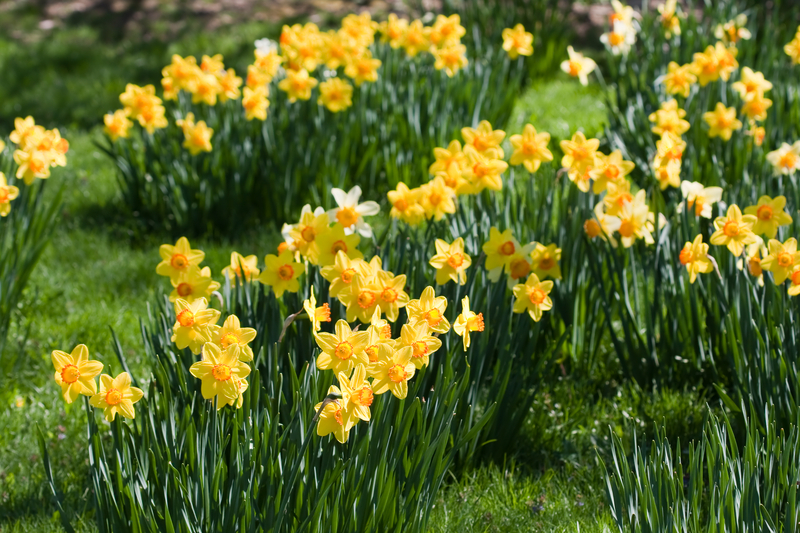 Learn all about daffodils and what they need to thrive here. This month the Abbott Martin & Cleghorn “traffic island” is again going through a transformation. The tall and stately elm that was for many years the highlight of this space died unexpectedly this summer and a redbud tree that had brought spring color seemed to have given up with old age. The demise of these two trees prompted me to seek out community partners to make this public space beautiful once again. This month in partnership with The Tree Foundation & Metro Public Works, we are planning and planting for the future of this green space in the heart of our business district. More on this project later! Today, I am looking forward to seeing the 10,000 daffodils planted by Cheekwood on the lawn behind their Pineapple Room restaurant for Cheekwood in Bloom. (Go ASAP, they are in full bloom now! ), and in the coming weeks, 100,000 tulips will be blooming too. One of District 34’s many treasures, Cheekwood is beautiful in every season, but spring is a special treat. I encourage you to join me as a member, if you’re not one already, to help support and preserve this unique landscape for generations to come! As your councilperson, I will be committed to protecting, preserving and enhancing District 34’s natural environment and special places. I will be committed to creating more vibrant, safe and beautiful public spaces and streetscapes throughout Nashville. Through intentional efforts, strategic investments, and community partnerships, we can make our city’s public spaces more beautiful. Let’s plan and plant for Nashville’s future together. Is there a public space in District 34 that could be more safe and/or beautiful? A triangle of concrete that should be a bed of native wildflowers? A spot that needs some daffodils? Go to my contact page and send me a message. I’d love to hear from you. Nashville Needs a Comprehensive & Actionable Transportation Plan (Yesterday). Councilwoman Angie Henderson, District 34 shared a post. It’s Transit Month, and my favorite way to travel to this and all downtown festivals is via WeGo Transit! Over the last several years, I’ve organized two Try Transit Days with the Nashville Cherry Blossom Festival as the destination. This coming Saturday, I’ll be at the Conference for Neighborhoods, but you can do your own Try Transit Day any day! I recommend you get the Transit App on your phone (it works all over the USA), which will show you the schedules for the closest route to your home/destination and all buses in real time. For District 34 residents, the closest routes are #5 & #7. $5 Parking is available until 6:30 p.m. in Nissan Stadium Lots E and F ONLY on South 1st Street across from Woodland Street. Unfortunately, we are not able to offer shuttle service this year. The walking distance to the Festival from Lots E and F is 0.4 miles across the Woodland Street Bridge or the Victory Memorial Bridge (James Robertson Parkway). Please make sure you are parking in Lots E and F. We have no control of pricing in other lots at the stadium.